Home » 2011 Minutes » Third time a Charm for MARFC at Auto City! Third time a Charm for MARFC at Auto City! September 17, 2011 Auto City Speedway Well, Mother Nature decided that this was going to be a great day and night for racing and to decide Auto City’s Champions. The MARFC Helmet Bag was presented to longtime competitor, MARFC Member and supporter and Michigan Motor Sports Hall of Fame Driver and ageless veteran, Jay Woolworth. Jay and his family have been huge supporters of racing at Auto City as well as many area tracks. Jay started out the night with a win in his heat race but unfortunately, a burnt wheel bearing sidelined him halfway through the feature race while making his way to the front of the pack. Jack Davis was our MARFC Member raffle winner. Thanks to Bob Ryder and Barry Meschke for helping out at the membership table. Yours truly had the privilege of driving the Auto City Speedway Pace Car for the night. 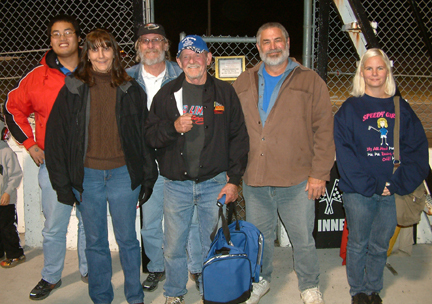 Thank You to Joe DeWitte and Sharon Fischer for re-scheduling this event after two rain-outs so we could enjoy some great racing action.Many thanks to Board Members pictured above with Jay Woolworth are Chuck Horan, Jeff Horan, Dennis Trinklien, and members Laura Tucker & Becca Pingel. Previous post Rain Date for Owosso Speedway works out great! Next post October thoughts from the President!